Animal Crackers was the second film starring the Marx Brothers, an adaptation of their popular Broadway musical of the same name, and it's a sporadically entertaining comedy with only flashes of the inspired genius the group was capable of at their peak. The film is burdened with too much extraneous material: sappy musical numbers, a leaden romantic subplot, and long stretches of gag-free dead time. The brothers are at their best when they're able to interact with one another, playing off of the unique comedic personae that they'd each crafted, and the possibilities opened up by different on-screen combinations. Pairing Groucho's leering patter with Chico's faux-Italian accent and penchant for puns yields a plenitude of particularly pungent wordplay, while Harpo's mimed perversity and coat-full of props plays especially well off the easily exasperated Chico. The film's best scenes come when this trio pairs off for extended gags. There's a delightful sequence where Chico and Harpo try to steal a painting, and Chico's simple request for a flash (as in flashlight) prompts Harpo into producing a dazzling array of items: a fish, a flask, and most ingeniously an oversized hand of cards ("a flush," of course). 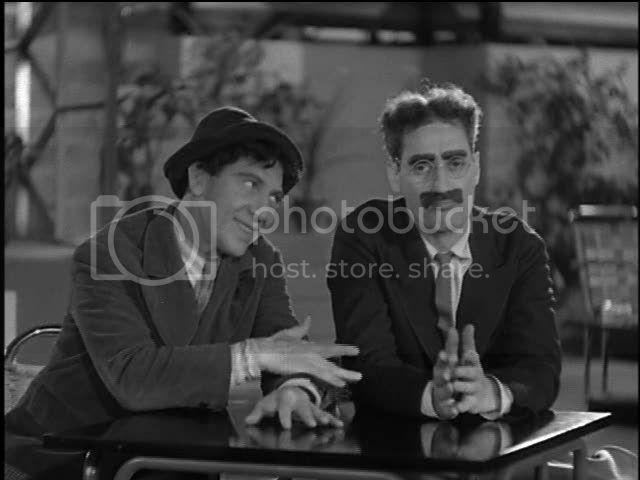 In another scene, Groucho and Chico begin by discussing the stolen painting and somehow wind up talking about building a house next door, the conversation proceeding through the typically torturous maze of Groucho's clever wordplay. Groucho is at his best when he can play off one of his brothers, particularly Chico. When he's performing with a straight man  as he does here in scenes with Margaret Dumont and Louis Sorin  he has to propel the dialogue alone, and though he still gets off some great one-liners ("I shot an elephant in my pajamas. How he got in my pajamas, I don't know"), the rhythms of the conversation aren't as fast and comfortable as they are with Chico. Dumont and Sorin, when acting opposite Groucho, mostly just mug broadly and roll their eyes a lot, smiling condescendingly at the jokes to indicate their stuffiness. Sorin in particular seems lost when he has to spar with Groucho, simply gesturing a lot with his hands, shrugging and looking around in confusion. It's not nearly as satisfying as the rapid-fire interplay the brothers have with each other. Even Zeppo, as always playing the straight man to his three outrageous partners, provides a better foil for his brothers, and a scene where he takes dictation from Groucho is hilarious and perfectly timed. This scene demonstrates, more than any other, exactly what's lacking when Groucho faces off against a more straight-laced actor. Zeppo doesn't have many overtly funny lines here, but he sets up Groucho with precision and an acute sense of comic timing, feeding his brother the prompts he needs to keep the scene flowing. As funny as the verbal dexterity of Groucho and Chico can be when set against someone who doesn't know how to handle it, their humor really only crystallizes when they're interacting. They know each other's rhythms and styles perfectly, and they know exactly how to integrate their personalities with one another in interesting and often hilarious ways. Unfortunately, the film's funniest scenes are diluted by the frequent diversions into musical interludes or unfunny bits with side characters. The minimal plot is really just an excuse for gags, but why then is there so much time wasted on developing bit characters who don't figure into the humor at all? The story centers on a party being thrown by the glamorous Mrs. Rittenhouse (Dumont), at which she and her suitor Roscoe Chandler (Sorin) will honor the African explorer Captain Spaulding (Groucho) by unveiling a rare and expensive painting. Of course, the painting gets stolen, and in fact it gets stolen several times, replaced with a series of fakes, which in turn are stolen themselves. This provides a fine opportunity for some madcap farce, but the film stalls whenever it detours too long into subplots involving the romance of Mrs. Rittenhouse's daughter (Lillian Roth) and her dull boyfriend (Hal Thompson), or a pair of society ladies who wish to embarrass the party's hostess. This stuff is dull and pointless, a distraction from the inspired lunacy of the Marx quartet, who barely interact with any of these characters. 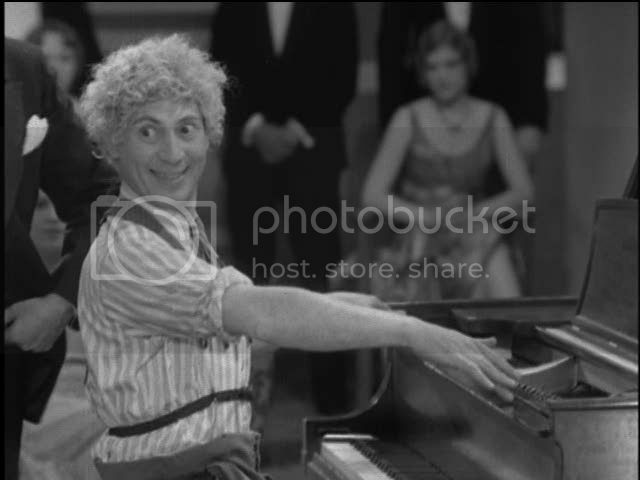 Most of the musical numbers are equally flat, though there's a lot to like about the scene where Chico and Harpo take turns at a piano. 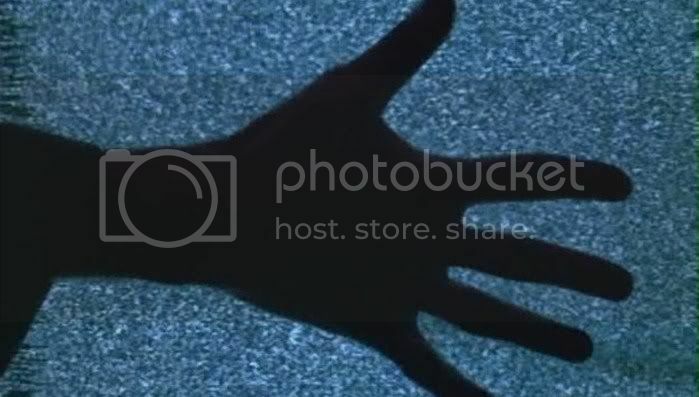 Chico mostly plays it straight, but invests all his humor into his hands, playfully running them across the keyboard, his finger pointing at the key he's about to touch as though scolding it or shooting it, his thumb pulling an imaginary trigger as he hits the note. A later scene where Harpo plays a harp isn't quite as amusing, mainly providing an excuse for the silent brother to display his musical virtuosity instead of his humorous antics. As self-indulgences go, it's not bad. The less said about the straight-up musical numbers, though, the better. They're chanted by the cast with so little feeling that everyone looks like they're on the verge of falling asleep. The film also has little to offer as cinema, since the adaptation makes no attempt to truly transfer the material from stage to screen. The direction, by Victor Heerman, is routine at best and inept at worst, and there are frequent jarring transitions, even in the middle of scenes, where multiple takes are shoved together without any regard for matching the position or poses of the actors in the frame. This isn't a graceful or well-made film by any means, and the fact that at its best moments it can still reach such heights of entertainment is a testament solely to the peculiar, irrepressible charm of the Marx Brothers. oh you wear a necktie so I'll know you. Like Elvis Presley, if we had been waiting for a good film, we would have had no film at all. Back in about 1983 I saw a magazine I had never seen before and it had Groucho on the cover so I bought it. I am still subscribing to Vanity Fair 3 editors later, although Groucho has never been mentioned again.